New Delhi– Reliance Industries Ltd Chairman Mukesh Ambani on Friday said India will become a $5 trillion economy well before 2024. “Thirteen years ago, when I spoke here, India was a $500 billion economy. And I said in 2004 that India would be an $5 trillion economy in 20 years. Today that prediction seems certain. 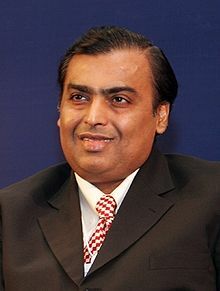 Indeed, it will be achieved well before 2024,” Ambani said while addressing the HT Leadership Summit here. “We are in the age of super-intelligence. What manufacturing was for China, super-intelligence will be for India. We have the opportunity to not only rapidly grow our own economy but also to be the provider of intelligent services to the rest of the world,” he added. “Just one year back, India was ranked 150th in the world for mobile broadband. Now it is number one, after the launch of Jio. “Let me correct you. Sunil is a good friend and not a rival. I think what he said and what may have been interpreted may be different. But let me make my point of view clear. I think that for all of us in the industry, profits and losses are risks that we take. And I don’t think that we can rely on governments and regulators to guarantee our profits and losses,” Ambani said while replying to a question at the summit. He was asked to respond to comments by Mittal recently that said Jio’s foray into Indian telecom market with its free voice and data offer had made incumbent players to write off investments of up to $50 billion.